I seem to have a perpetual list of ‘must try’ restaurants which never gets any shorter. A destination that’s been on it for a while now, after I unfortunately missed the launch event, is the Smokehouse in Pontcanna, which describes itself as an authentic American barbecue. I’d heard mixed reports about both its authenticity and how enjoyable the food was, but it seems to be proving popular (it’s apparently quite difficult to get a table!) so I was still keen to try it for myself, and Mr W and I paid it a visit a few Saturdays ago. Saturday night – or at least the one we chose – perhaps wasn’t the best time to visit in hindsight. The restaurant is fairly small, but there were two large parties in there. One group wasn’t being particularly noisy, but the other was, and with it being a relatively small room, we found the noise from the large groups completely overpowering to the extent that we actually struggled to have a conversation at some points during the evening as we couldn’t hear each other! We decided against a starter, having heard that the portion sizes were quite large. The starter selection was relatively small anyway (perhaps they realise they won’t get many takers, given the size of the mains! ), and nothing particularly leapt out at me! The main courses were divided into barbecue-style meals and burgers. We both decided to go with a barbecue option, and although I was tempted by the beef brisket, I couldn’t resist the pulled pork in the end (I seem to be ordering pulled pork pretty much everywhere I can at the moment!) and Mr W chose a half rack of ribs. 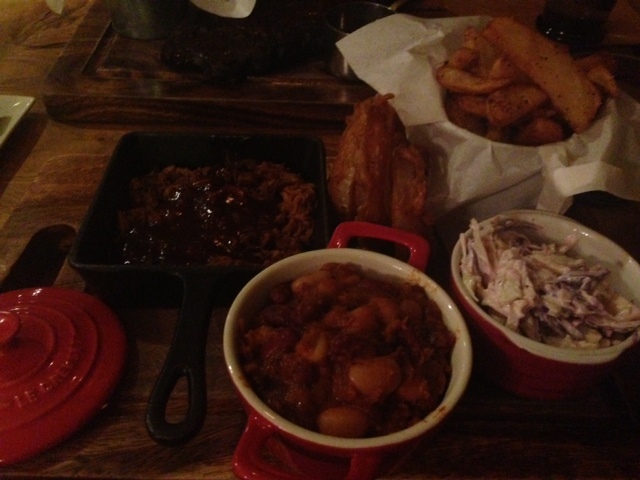 Both dishes came with a number of sides: chips and slaw for both of us, plus onion rings and barbecue beans for me. 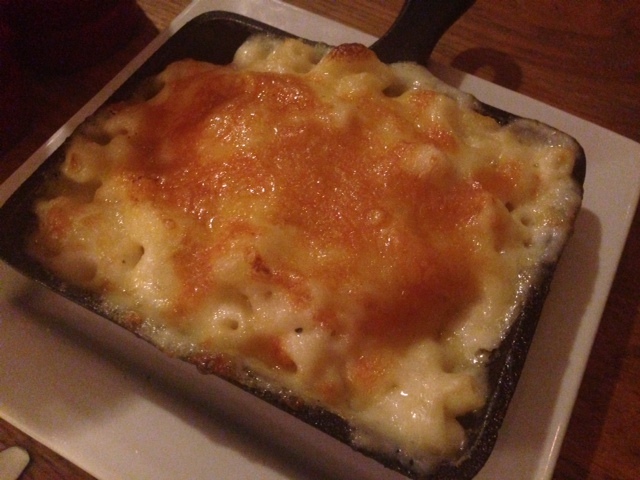 I was a little bit unsure as to why I had two extra sides, and we ended up sharing both of those too, plus an extra one off the menu of macaroni and cheese (since when has that ‘and’ started creeping in to macaroni cheese in the UK?!) Most of the main dishes are available as side orders too – so I could have added a side of beef brisket if I’d been feeling even greedier than normal! Mr W’s ribs were excellent, with a lot of meat to get through and a very tasty sticky glaze. 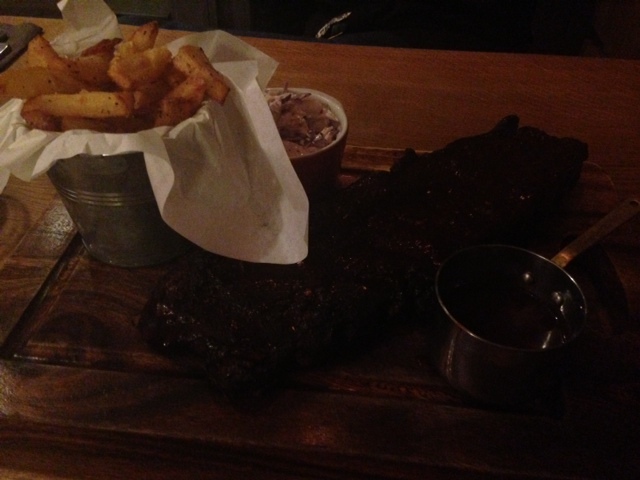 I’d defy anyone to eat a full rack of ribs on their own as the half rack was enormous! My pulled pork was pretty good – not the best I’ve had, but certainly not the worst – it was moist and tasty, and there was just the right amount of tangy barbecue sauce in the dish with it (which wasn’t mixed in initially but I decided to mix it through the meat). The chips started off really good, as the ones at the top of the pot were lovely and crisp, but towards the bottom, some were a little soggy. Onion rings were excellent, and the fruity slaw, which had slices of apple as well as cabbage and onion was a refreshing contrast with the richness of our meat dishes. Mr W is not normally a lover of coleslaw, but particularly enjoyed this take on it! The barbecue beans were probably a bit surplus to requirements with my pulled pork, but very good, and the macaroni and cheese came to life with a bit of seasoning. If anything, I’d have liked slightly more meat and fewer sides as part of my main, but all in all, the proportions were about right. The meals were fairly reasonably priced too. I liked the way the dishes were presented, with lots of little pots, cups and dishes on wooden trays – I’m a sucker for those mini Le Creuset casseroles! As soon as we’d arrived, I’d spotted a blackboard on the wall listing some American-style desserts, one of which had leapt out at me as it’s one of my favourite puddings – but seldom available outside the USA: Key Lime Pie. So, you can imagine my disappointment when I ordered it and was told they’d run out!!! It was a shame it hadn’t been crossed off the blackboard menu, as some items had been on one of the other blackboards. 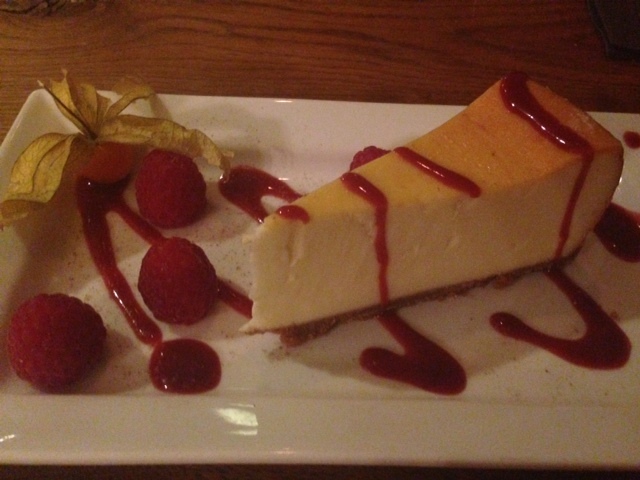 I was unconvinced by the suggested alternative of New York Cheesecake. I find some baked cheesecakes can be a bit ‘claggy’ but in the end I was persuaded to try, and I was glad I did, as the cheesecake turned out to be creamy, silky and rich, with a crisp base and just the right amount of fruit to temper the creaminess, so all was not lost! Service was excellent throughout the meal – a really friendly team of staff who looked after us well and didn’t seem perturbed by the rowdy group of diners that was causing all the noise! On the whole, I really enjoyed the Smokehouse. It was a healthy portion of good food, exceptionally tasty and served in a very friendly place. I wouldn’t necessarily rush back on a Saturday night (at least not without checking whether they had any large groups booked in), as the size, layout and acoustics of the place make it inevitable that a large group will all but drown out quieter conversations. I will definitely be going back though – I need to try that Key Lime Pie!